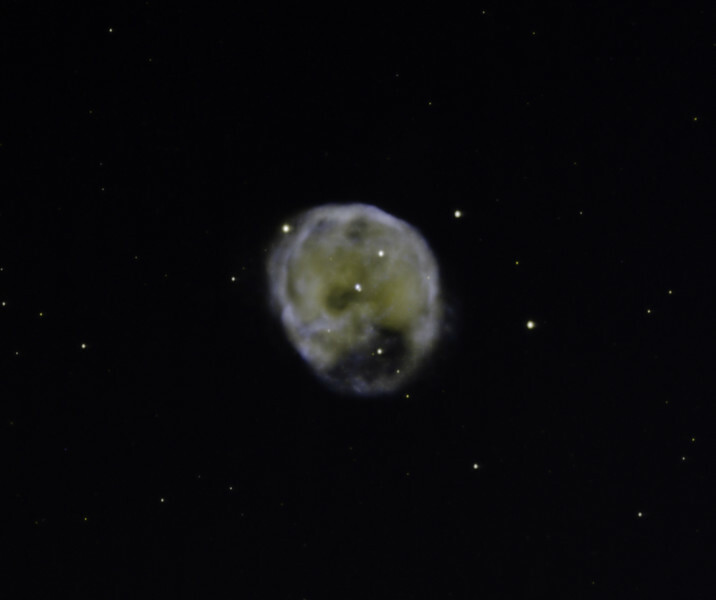 NGC 246 is a moderately large (4 min arc) moderately bright (mag 8.2) planetary nebula in Cetus, which has a famously skull-like, or at least "scary face" look to it. Here, we've managed to resolve the mag 12 white dwarf separately from its brighter binary companion. The ESO docco for this object describes it as moving upward relative to the interstellar medium, resulting in a noticeably brighter shock front at the upper leading edge. H-alpha (yellow) 8 hrs, OIII (blue) 8 hrs, both in 1 hr unbinned subs. There was negligible SII and we've not included any here.